What's the best travel insurance for trekking in Nepal? Why you need travel insurance for trekking? This trekker is suffering from altitude sickness. She needed travel insurance to help her back. If you don't have insurance when trekking in Nepal then not only is your life in real danger but it will end up costing you your health and your bank account. The obvious afflictions when trekking are things like a sprained ankle or even a broken bone. I've seen plenty of these when trekking. The not so obvious are afflictions like altitude sickness, food poisoning, hypothermia, appendix ruptures, skin infections and respiratory infections. If any of the above happens to you at 4,900 feet up a mountain then there's a strong chance you won't want to be spending days or weeks trekking back to Kathmandu to a hospital. You'll need a helicopter to get you down. A helicopter evacuation in Nepal costs a minimum of USD $5,000. That's not including any hospital treatment or in-flight medical services which are now mandatory. Due to this cost alone, many insurance companies are no longer fully covering trekkers. Good hospitals in Nepal are rare. The rare, good hospitals make a lot of money from trekkers in need of medical care. They charge a lot! Without the right travel insurance covering you then the bills can be astronomical. How often do people get sick trekking? I've never been on a trek where I haven't seen at least one person turning back due to sickness or injury. In all but one trek I've seen helicopter evacuations. The most common ailment I see is altitude sickness. I've seen plenty of people be sensible and turn back early. I've seen the mistakes of others who continue on until they start to vomit and pass out. At this stage nothing saves them other than an emergency helicopter evacuation to a compression chamber in Kathmandu. I've seen plenty of sprained ankles and two broken ones. Anyone with a broken bone in their leg needs a helicopter. The guy with the sprained ankle tried to wait a week so he could walk out. But in the end the altitude and isolation was too much so he called a helicopter. Yes, taking safety precautions helps a lot in reducing the need for medical care when trekking. But the best precaution is ensuring you have good travel insurance. I met Carl on the Annapurna Circuit. He'd been held up in a remote tea house just below Manang for three days. He was using a trekking pole as a makeshift crutch. He was pale, in pain and dejected. He explained that he'd lost his footing on the main trail coming down, twisted his ankle and asked a passing villager to help him here. 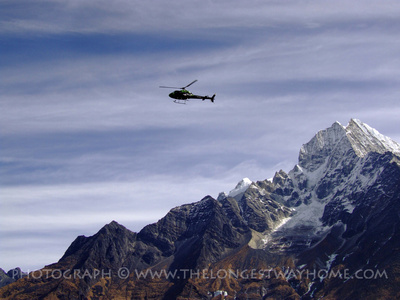 Getting rescued when trekking means a $5,0000 helicopter evacuation! - World Nomads will cover this for you. Carl thought the ankle would be better in a day or two. But instead it swelled up and became very painful. His biggest problem was that he didn't have travel insurance and needed a helicopter to get out. It was going to cost $5000 which he didn't have on him. The guesthouse had a phone. But the cost to call his parents in the USA to ask for a money transfer was huge. Not only that but to arrange the money transfer at all was problematic as the emergency evacuation team needed it up front or an insurance number. It took Carl days to arrange for his parents to contact the medical team in Kathmandu and then to arrange immediate payment via wire transfer which added 15%! This afternoon the helicopter would arrive and take Carl to Kathmandu and a hospital where yet more bills would await him. I remember looking at my own World Nomads travel insurance policy that night and was so grateful I chose a policy that covered me up to 6,000m. 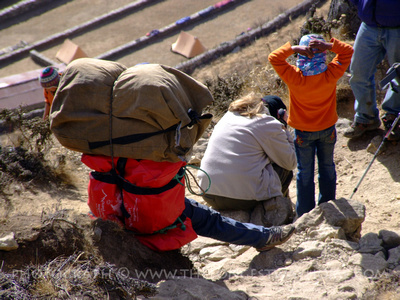 Do you need special travel insurance for trekking in Nepal? Basically, yes. What you really need to do is check the small print of your policy and make sure you are covered for A) adventure activities B) over a certain altitude. Many travel insurance companies do not cover people over 4,000 meters! Considering popular treks like the Everest Base camp and The Annapurna Circuit all have passes over 5,000 meters this is something you have to make sure! Do note that most credit card travel insurance companies do not cover you for trekking at altitude either! The best thing you can do is call up your insurance company and ask if you are covered for trekking in Nepal up to and just over the altitude you will be trekking to. The great thing with my travel insurance with World Nomads is that they have add on's which allow me to trek up to various heights e.g., 4,000 meters, 5,000 meters and even 6,000 meters. World Nomads specialize in "travel insurance". They know what adventure travelers want and do! Who can buy it? World Nomads Travel Insurance is available to residents in over 150 countries. Do they cover trekking? They cover adventure sports & mountain activities which includes trekking. That's not all. If you decide you want to cross a high pass you can boost your policy up a level to make sure you are covered. And, you can do that all online! Easy. Can I just get coverage for my trek? World Nomads allows you to take travel insurance out for a just a few days, weeks or months. World Nomads also allows you to extend your policy from anywhere in the world including Nepal. I'm already traveling! Can I get travel insurance? Yes if you have already begun traveling then with World Nomads you can get covered whilst abroad! Where can I buy it? World Nomads is only available to buy online via their website by credit card. Simply visit World Nomads to start.